Located in the area of the modern town of Mleiha, approximately 50 km east of the city of Sharjah. The ancient site of Mleiha is comprised of a wide agricultural settlement containing a variety of archeological features which date to the post Iron Age, the Hellenistic period and post-Hellenistic periods. Until recently the oldest archeological discoveries recorded at Mleiha dated back to the 3rd century BC, however recent discoveries of an Umm an-Nar tomb at the site have pushed its ancient history back to the 3rd millennium BCE. The tomb was discovered within a date palm orchard by archeologists from the Directorate of Antiquities in Sharjah in 1988. Its layout is typical of an Umm an-Nar tomb plan with its circular construction. 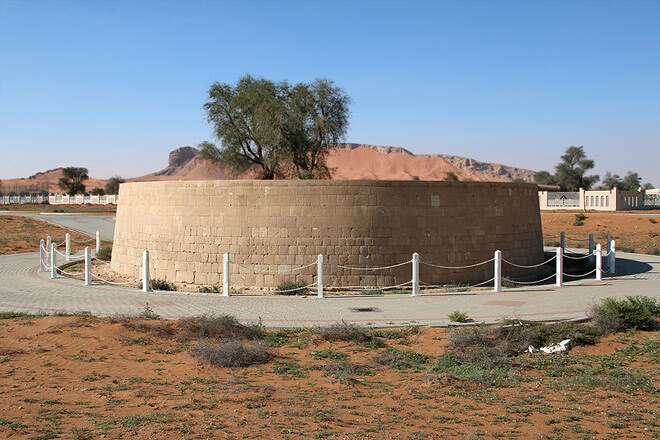 Measuring 13.85 m in diameter, it is the second largest Umm an-Nar tomb to have been found after one in Ras Al-Khaimah which measures 14 m.
The tomb was based on foundation ring made up of un-worked blocks of stone. It is faced with uniform limestone ashlars. The tombs’ entrance is at the northern side as indicated by a large rectang ular shaped ashlars bearing a relief decoration. A particularly interesting feature of this tomb is the presence of a large stone which served as a gutter for draining water from the roof. The interior of the tomb is divided into eight units, each of which contains a corbelled burial chamber. The floors inside the burial chambers are paved with stone blocks. Skeletal remains associated with Umm an-Nar type materials were encountered within the burial chambers. These finds included painted pottery, imported incised grey ware, soft stone vessels, personal items of jewellery and metal artifacts such as bronze knives and socketed spear heads.